The Department of Information Technology & Communication, Govt. of Arunachal Pradesh has implemented e-Cabinet solution for the cabinet members of Govt. of Arunachal Pradesh. Using this system, the cabinet members can access the cabinet notes before the meeting. The entire business of the Cabinet can be conducted using e-Cabinet solution. e-Cabinet, is a powerful tool that the Arunachal Pradesh government plans to use to streamline its decision-making process. The solution lets Cabinet Ministers to prepare for cabinet meetings, conduct them and review minutes, entirely without paper. The system is a multi-user secure solution that keeps relevant information organized and updated in real time, giving ministers a clear overview of each item under discussion. Before the cabinet session begins, the ministers can access the system to review each agenda item and determine one’s own position. Once Arunachal Pradesh adopts the e-Cabinet system, the average length of the cabinet meetings will cut from 4 to 5 hours to just 30 to 90 minutes and the government also can eliminate the need to print and deliver thousands of pages of documents. e-Cabinet uses web-based software and ministers can take part remotely also. 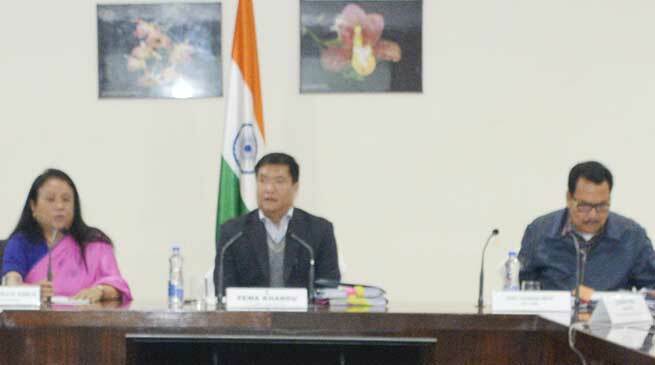 Chief Minister Pema Khandu has appreciated the newly adopted system implemented by Department of Information Technology and Communication. Chief Secretary Sakuntala Gamlin gave an introduction about the e-Cabinet solution implemented in Arunachal Pradesh followed by a brief presentation by Special Secretary Department of Information Technology and Communication before the Cabinet Members. Secretary, IT also noted that this e-cabinet solution will give remote access to Cabinet Ministers to view Cabinet notes and the same will be circulated well in advance for proper analysis and feedback. Department of IT and Communication also distributed one secured tablet to each and every Members of the Cabinet through which the Cabinet Members can access the e-Cabinet solution.